210 pages | 9 B/W Illus. "From Viking Island to Schon's swamp: this book has diversity and depth. It has grown out of the arts and arts therapies training and research at University of Derby and gives us a wealth of riches. There are valuable insights into educational process and student led learning. We are shown the enrichment of tutors and students when they share playful learning. As readers we also grow through understanding concept mapping, liminality, lifewide learning, and flexible purposing. 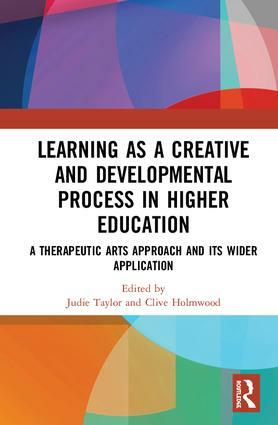 I strongly recommend this book as a treasure chest of creative research, theory and practice." Professor Sue Jennings PhD has pioneered dramatherapy and neuro-dramatic-play worldwide for over fifty years. She is visiting professor at University of Derby and Professor of Play, a life-long award given by the European Dramatherapy Federation. She is a prolific author with over 50 books in print. Chapter 3 Re-thinking uncertainty in higher education using Klein’s concepts of the paranoid-schizoid and depressive positions. Chapter 8 Configuring the personal/professional self. Chapter 11 Tutor-led peer supervision groups within higher education. Judie Taylor has recently retired as a Senior Lecturer and Therapeutic Arts Manager after a 30-year career at the University of Derby, where she was a tutor on the BA (Hons) Creative Expressive Therapies and postgraduate Arts Therapies programmes and was part of the team who developed them. Clive Holmwood is a Dramatherapist with over 20 years' experience working with children and adults in the public, private and voluntary sectors. He is currently Senior Lecturer in Dramatherapy and Admissions Tutor for the Creative Expressive Therapies degree at the University of Derby and a Director of Creative Solutions Therapy Ltd.